Invisalign uses a series of clear, specially designed aligners to straighten your teeth. 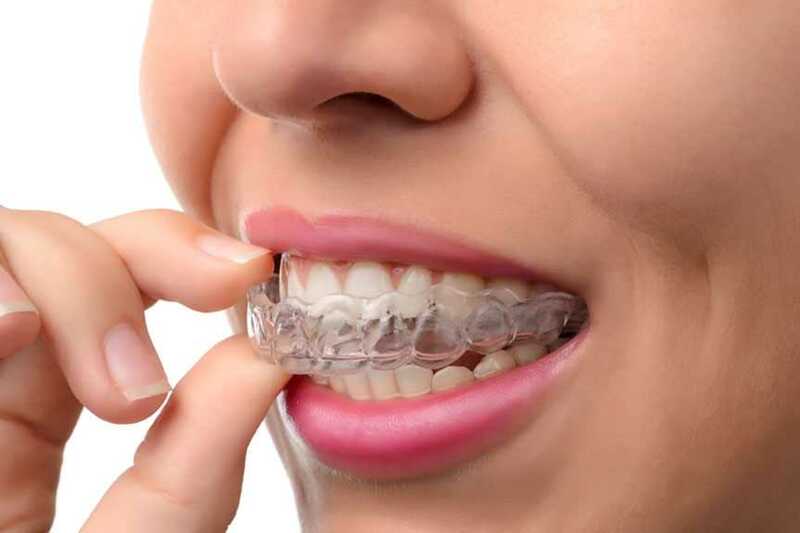 Unlike braces, the aligners can be removed to eat, brush, and floss.Invisalign is particularly effective in correcting minor orthodontic irregularities and orthodontic relapse from not wearing retainers. For effective tooth movement the aligners must be worn 23 hours each day. At your initial consultation, Dr. Nosratian will discuss the option of Invisalign based on your unique orthodontic needs and treatment goals. If you are a candidate for Invisalign we will start the process by creating 3-D models of your teeth. Dr. Nosratian will then align your bite digitally using Invisalign computerized software. Once Dr. Nosratian has determined your ideal tooth position, a series of aligners are created using CAD-CAM technology at the Invisalign lab. At your following appointment we will bond any attachments, if needed, and you will begin wearing your aligners. As you change to a new set of aligners about every week, your teeth will move gradually until they reach their final positions. You can expect to visit our office about once every six to ten weeks to ensure that your treatment is progressing as planned. If you are looking for a good dentist that won't lie and cut corners on your treatment, then you've come to the right place! Dr. Nosratian is very caring and knowledgeable, she explains everything in detailed and shows you on the screen so you can see why she is recommending the treatment. Her assistant Maggie is just a sweetheart and very on top of things! I've been to many different dentist and I can assure you they are a great team that care for your well being. Is it possible to actually love going to the dentist? In a word: Yes! For someone who has anxiety about going to the dentist, Dr. Nosratian has put me completely at ease. The staff is extremely friendly and welcoming. They treat you like family here. The office is beautiful, and they work with your schedule. They can get you in fast in case of an emergency situation. Dr. Nosratian is by far the best cosmetic dentist in the West Hollywood area. She even treats celebrities! I would highly recommend her practice to anyone who is looking for a friendly dentist who also provides quality dental work. Thank you so much again, I am so happy that I have found a dentist that I know that I can trust! Dr. Fara was referred to me by a family friend. I came to her office not having seen a dentist for nearly 4 years. Of course I had a bunch of cavities, and was worried about a potential root canal. I had never seen a dentist work so hard at filling my cavities with such great care. She keeps my teeth in great shape all while being kind and thoughtful about the patient's experience. Hands down the best dentist I've ever had. Dr. Nosratian has been a great dentist for me, my children, my parents and my in laws. She is beyond caring and gentle. We have had negative experiences with other dentists, but Dr. Nosratian took that fear of meeting a new dentist away from the moment that we met her. My family and I have been going to Dr. Nosratian for over 14 years and in all those years I have never felt I needed to question her integrity or her methods. We keep referring people that we love to her since we have complete trust that she will treat our loved ones like her own family. My family has been blessed to have found Dr. Nosratian that goes above and beyond to make our dental experience a very positive and very pleasant one. I highly recommend her and her staff. Thank you Dr. Nosratian and your wonderful staff for always giving us the best possible care at your beautiful state of the art dental office. Dr. Nosratian is hands down the best dentist I've been to. I'm no stranger to dental work and her work is impeccable. She has great bedside manner and takes the time to explain the procedure and each step, and I've never had any issues post procedure. I also did my invisalign treatment through her and she did an amazing job, I am so pleased with the results! It takes two to tango though so make sure to follow all her instructions throughout the process for the best results.